In 2007, ideas starting buzzing in the Jane-Finch community on what was needed to better support local artists and resident groups. Energy was created, and networking began to talk about the neighbourhoods creative needs. Since then, artists and organizations catering to various interests, age groups, and art forms have unified in collaboration with the City of Toronto, and the Toronto Public Library. On June 29th, the result of these efforts will come together at the grand opening of the York Woods Arts Hub. This week, I had the opportunity to listen in on a planning meeting and sit down with Laura Metcalfe (City of Toronto), Sun a.k.a The Real Sun (No Mans Land, Lost Lyrics), and Sabrina Gopaul (Black Creek Community Health Centre, The Life Movement, Jane-Finch.com), to discuss what has gone into making The York Woods Arts Hub a reality. How have local residents been involved in planning the York Woods Arts Hub (YWAH)? Sun – It started as an email list, with a vision to connect different groups within the community. The idea was for a non physical space, like a network, where we wanted to connect artists and arts groups within the community. This evolved once we started to identify the common needs. Out of those discussions it was decided that we need physical space. There are a lot of artists and arts based programs out here that are working independently. There are many music studios in Jane Finch, and that also comes back to the territorial divides that happen. I think it’s important for an arts hub to be accessible in neutral ground where people feel ok to come. My hope for this space is that yes it will be a space where young artists can come to develop themselves, get training, and hold rehearsals, but also a community space, where groups can connect and collaborate. Sabrina – [The earlier consultations] really frustrated me because it was all about this virtual reality and artists putting their tools online. That’s a huge barrier on the street level. People don’t know how to develop a web page, or put a cost to what they do. Laura– That’s why having a physical space that has computers and mentors, so people can actually come here and create those materials will hopefully fill that void. Sabrina – The physical space is needed. The rest is just quick fixes and not really investing in the artist or the culture. What was the motivation behind the YWAH? Laura – The City had a fund called Partnership Opportunity Legacy (POL) Fund, that was a result of the Mayors pledge to commit $13 million to capital projects in priority neighbourhoods. Through the Jane-Finch Neighbourhood Action partnership we tried to find out what the needs were. A lot of groups had no proper rehearsal or administration space, people doing things in their apartments all over the place. One group used to practice behind the gas station at the corner of Jane and Finch, now they practice at York University. None of them go to York University and security can kick them out. So they have no proper home and they’re a really talented dance groups. They won the Best Dance Crew contest on Much Music and several other awards. For a group of that level to have absolutely no infrastructure to support them is crazy. They are figuring it out on their own, and connections are forming, but we want to make the hub supportive to those networks. 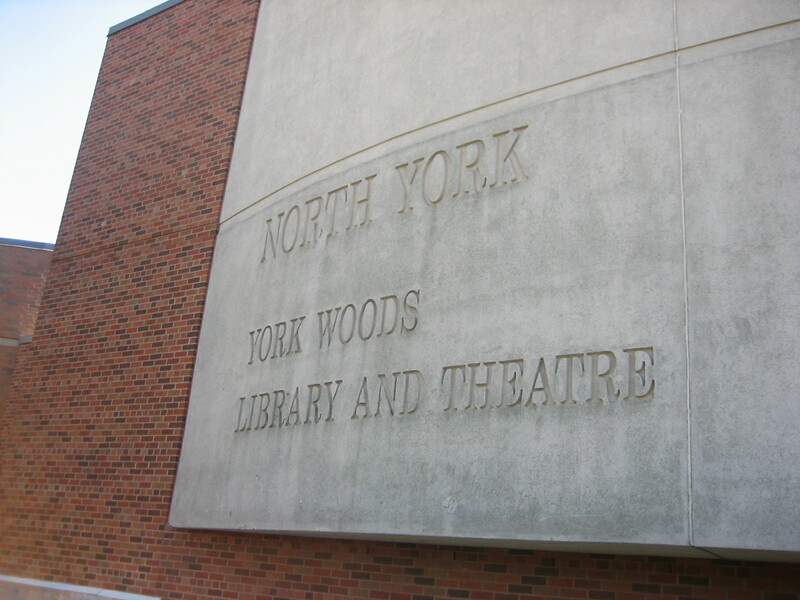 How did the York Woods Library (YWL) get involved? Sabrina – The idea of having a physical space in the Black Creek community be an arts hub is something that was identified. We know arts and culture live and bleed in Jane and Finch. When you look in the Jane Finch community, people are territorial with their space, there’s many barriers with using housing [for arts space]. For example, housing has been flexible, but is governed by it’s own policies. Laura – The library is part of the City’s ABCC’s (Agency, Board, Commission, Corporation), and this made the process smoother to support the hub with the POL fund. Given the fact that YWL has a theatre, we recognize it is a community asset that should be used more for local artists. How has funding been generated for the Arts Hub? The primary funding is through the POL, then the library kicked in a little bit of money and we are still looking for programming funding. What’s been most challenging in this process? Sabrina – Meeting times to engage the young people or those who are working 9-5 has effected momentum. Who is sitting at the table, what they are bringing. The library is bringing in their own vision, and the community really needs to be there to see it through. It’s been a conscious effort, but we need to continue. Laura – We did outreach and asked a lot of community people to join the table. There are understandable reasons why at this stage it is hard for people to attend meetings. This is an incredibly dedicated volunteer community. The majority of people who are sitting at this table are not paid. It’s hard for artists who are struggling to make a living to commit to a free project. Our hope is to eventually get funding to provide honorariums to community members to contribute their work. But that has been one of the biggest challenges – trying to get programming money. As awesome as this space this will be, we need it to be resourced and that came out loud and clear at the community meeting. We need to have staff to coordinate and support artists who come through. It would make me sad if we put all this money and time into building a space that isn’t properly resourced. That’s the challenge ahead. This is an incredibly dedicated volunteer community. The majority of people who are sitting at this table are not paid. It’s hard for artists who are struggling to make a living to commit to a free project. Our hope is to eventually get funding to provide honorariums to community members to contribute their work. How are you working around this challenge? Sabrina – A lot of artists do a million-and-one things, and part of their living is the product of their art. As membership increases, YWAH could be a place for social enterprise to incubate. Again, it’s making sure the space is resourced to facilitate that outcome. But it’s possible. I know a lot of moms who do art, crafts, sell them during the holidays, young women braid hair in the hallways of the buildings, and you know that’s how they get their lunch money. It’s now capitalizing on that and investing on how to make that your income. Sun – Speaking from an artist point of view, it would be ideal if it was a space where we could produce and sell our art at the same time. Like how a hair dresser rents out a chair, and part of their commission goes back to the salon. It would be cool if we could have something like that, where artists could sell their stuff out of an arts hub store. What is your vision for the YWAH opening? 5 years from now? Sun– For the opening to be a real ceremony where we bring people together, have a drumming circle, bless the entire space, be a launch that creates momentum, but that there will be something that comes after. Ideally we have resources in place and programs up and running immediately. For the arts groups in the community who are working independently to be at the launch, meet one another, for us to have welcome packages on how they can get involved, and keep a sustainable membership and momentum. I would love it if any young artist from the community could walk into that space and feel like they are at home, because they are among people who share their passion. Five years from now for that to be continuing. Everything is good in the initial stages when something gets launched, but in 5 years for us to take that forward, have it be sustainable, and expand it. Laura – Hopefully some of the artists who come through at the beginning will benefit from the space and in 5 years be successful and want to give back and mentor other artists. Build and continue. Sabrina– It would definitely be stability for these groups. A lot of the coordinators of these initiatives, half their stress is time spent finding space. We need safe space that young people, participants, can feel like they’re welcome. They’re not going to be persecuted for being there, they won’t be harassed, they have a safe space to explore their art, to find new boundaries for their art, and find their identity through their art. It’s a home. Sun – When I was in high school I didn’t have mentors, I kept my art to myself, and I didn’t have anyone to guide me. If I was that age again I’d want a space where I felt welcome and had positive role models to look up to and relate to me as an artist. You don’t know what that can do for somebody, especially a young artist, it can be a pivotal point that can change your life forever. That would be amazing if we could provide that space, mentorship, and energy for young artists in the community. A trend I see happening in the sector is that youth groups are working in isolation and reinventing the wheel because they don’t have mentors or elders to look up to and guide them through something that has already been done. We’re sitting here as youth saying “oh we have this great idea, we’re the first ones to do it”…But we’re not, it’s been done before, there’s a disconnect. I hope this will be a space where we can fill those voids and provide guidance. This entry was posted in Interview, Spaces and tagged arts hub, community arts, Jane-Finch, Laura Metcalfe, Sabrina Gopaul, Sun a.k.a The Real Sun, York Woods Library by Neighbourhood Arts Network. Bookmark the permalink.